interacting with readers while rocking the little ones to sleep. In this article, I’ll share some health concerns for bloggers shared by myself, clients, and blogging friends. We’ll also cover suggestions to improve each. There are affiliate links in this article which means, at no additional cost to you, we could receive compensation for our recommendations. You can read our full disclosure policy. 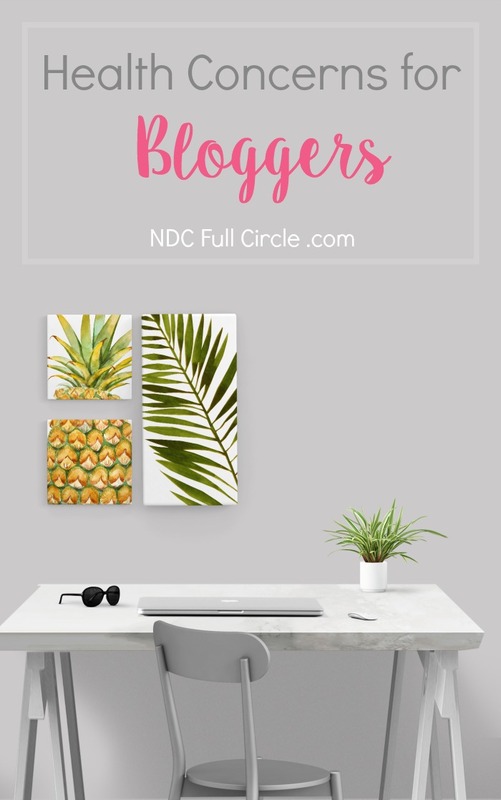 Bloggers sit for long stretches of time when given time to work. We also have a tendency to snack or eat a meal while we’re working (I am SO guilty of this). use timers like these free ones or the free Chrome extension, “Strict Workflow.” It’s based on the Pomodoro method, so you work for 25 minutes and take a break for 5.
use 5-minute breaks for stretching, jumping jacks, or other easy-to-perform movements. I’ve started to do 50 jacks, 10 pushups, 10 lunges (5 on each side), 10 pushups, and then another 30 jacks. It takes just about 4-minutes to do it all. walk on a treadmill while scheduling social shares. I use this on my treadmill and even take calls or do Facebook LIVEs while on there. if working in dim light, turn down the brightness on your computer or adjust your settings to reduce blue light. reduce glare from windows or lighting by changing positions or installing an anti-glare screen cover like mine. give your eyes a break following the 20-20-20 rule (every 20-minutes, look at something 20 feet away for 20-seconds). 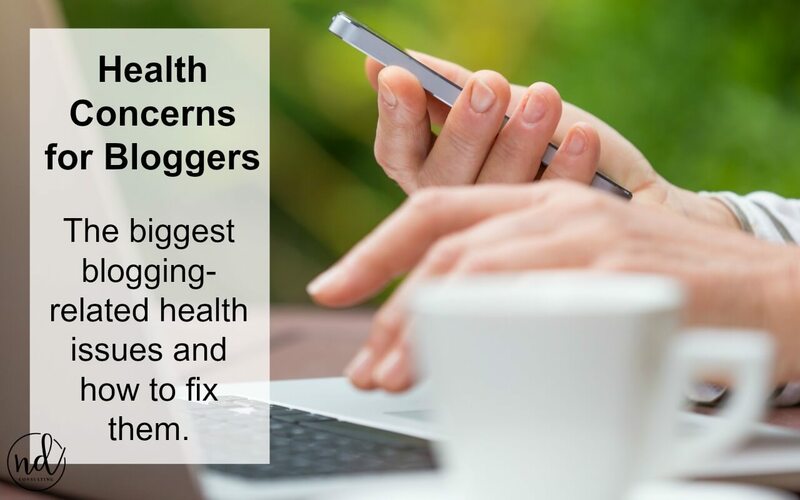 This is one of the most common health concerns for bloggers. It’s awesome we can type a billion words a minute but it stinks when we start hurting. giving our wrists a break! Use dictation software to write posts every once in a while – I like to dictate in OneNote on my iPhone and then copy it into WordPress on my laptop. use the right tools to offer support. Wrist supports are inexpensive and plentiful. try a wrist brace while sleeping (pick one up at your local pharmacy). When I am working in Photoshop, there are 100 times a day I catch myself leaning juuuuuuuuuust about an inch away from my screen! My posture started to suffer and I took action. I got a brace (I tried 3, but this posture brace is the one which works for me). stretching for the final 1-minute of my 5-minute break every 25-minutes. get a standing desk set up to work on the kitchen counter. Mine can also be used on my dining room table, in bed, snuggled up with a cup of tea, or on the back deck. 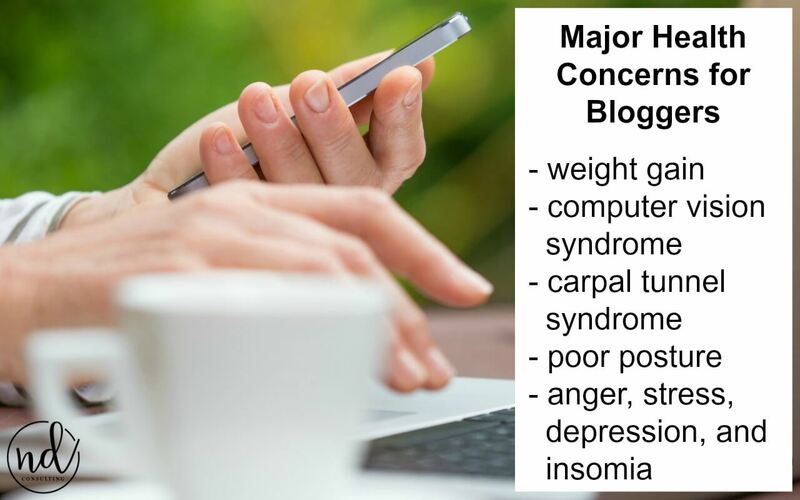 These are significant health concerns for bloggers and because each of us has different triggers, it’s hard to discuss. We’re on social media ALL THE TIME so we are the first to know about local, national, or global tragedies, which can be debilitating. Far from only outside forces, we can get into a trap of ourselves to others’ journeys we know nothing about, not growing “fast enough,” and can even develop imposter syndrome. And stress? Stress can be from something as tiny as clickbait to issues as big as unsupportive family members. don’t tell yourself, “Just one more ___ before I head to bed.” STick to your schedule. turn off your Facebook feed. The Newsfeed Eradicator Chrome extension saved me during the last election and during busy months like this one, it allows me to be more productive. use timers (seriously, just try it) and batch your tasks. If you want to get away from hurried writing, editing, image creation, or promotion, batching is the fastest way to a new routine. It’s a fun job, but professional blogging has it’s own health concerns. What about you – have you faced any health issues from blogging? Excellent health tips, Sarah. I also use a portable stand and I love it. We spend way too much time sitting. Horrible for posture and our overall wellness.